Touch let us know about these 4 digit SPI controlled 7 segment displays that cost a little less then $1 a piece. They include decimal separators and a colon separator so it’s easy to display time. This entry was posted on Monday, September 17th, 2012 at 1:00 pm	and is filed under parts. You can follow any responses to this entry through the RSS 2.0 feed. You can skip to the end and leave a response. Pinging is currently not allowed. 10 pieces of 4-digit displays with controllers for $10 total sounds like a really good deal – that is if you’re US-based and paying only $3.75 for shipping. Ya, I’ve seen these around for awhile. 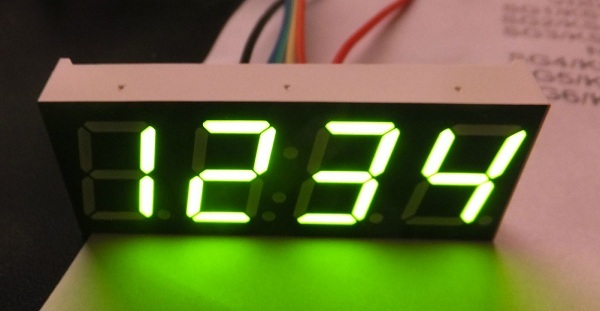 Alas, there are no six-digit with separating colons for a “real” clock display. You really can’t chain them as there are missing colons. Too bad. So I guess it is back to building six digit clock displays from discrete 7-seg LED’s and a uC “backpack” to mux/drive them. Something I’ve got on my to-do list (or maybe someone has seen a six-digit clock display?). From the picture, it looks like you could use just two discrete green LEDs in between adjacent 88:88 blocks and have a colon display that would match pretty well with the spacing on the built-in center one. Any idea as to pinout & power requirements (3.3v vs 5v)?